I always believed the best thing that can be gifted is a book, and I have this habit of gifting my close friends with books I believe they should be reading. My friends accuse that I gift them books that I wish to read. I probably prove this allegation by borrowing the book immediately after gifting it to them! So, recently I bought this book for a very good friend of mine and ended up reading it before she could even start a page. This book is about working women and their work, home, Husband, kids and everything about their life. All these reasons convinced me that it would make a wonderful gift for my friend. The book is truly an inspiration to all working women. The author manages to give a quick dossier to reach perfection in both personal and work life, while managing multiple hats all at the same time. The book is divided into three neat sections, with each section comprising ten chapters. Each of the chapters is a simple life funda explained with a small anecdote from the author’s life experience. Prime among these chapters are concerns of the glass ceiling, juggling home and work, training the husband, etc.. The writing is crisp and it is an easy read. The tagline of the book – The adventures of a woman at work, though is misleading. It should rather be adventures of a working woman! Overall, irrespective of whether you are a working woman or not, or you are a woman or not, you will connect to what is being said in the book. 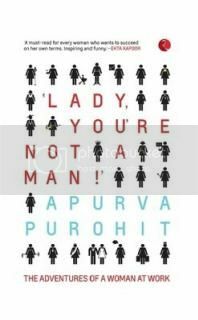 Posted in Books, Review Tagged Apurva, book, Lady, purohit, review, You're Not a Man!